Climate change is having a growing impact on water supply, more knowledge is needed about nanoparticles, and the realisation of a more circular economy requires that drinking sector residual streams be made more suitable for practical applications. These are some of the conclusions of the second OperAqua symposium which was held at KWR on Thursday, 3 December. 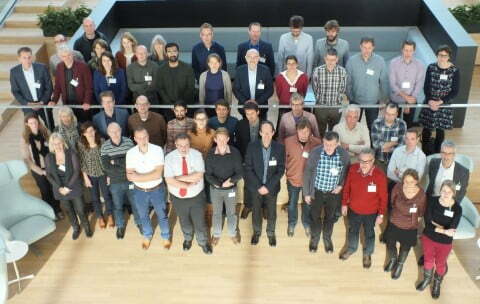 KWR hosted the second OperAqua symposium on 3 December. More than 50 participants from De Watergroep, VITO, KWR and representatives of the Dutch water companies were presented with an overview of the 3-year OperAqua, the collaboration between De Watergroep (B), VITO (B) and KWR (NL), within the framework of Watershare®. OperAqua involves the conduct of a research programme aimed at optimising the operational management of water companies and removing bottlenecks. By means of this collaboration, De Watergroep also participates in the joint research programme that KWR carries out for the Dutch drinking water companies (BTO). The symposium provided a broad picture of recent developments in the areas of safeguarding of water supply, analysis techniques, nanotechnology and the valorisation of residual streams. In order to bring about a more circular economy, the valorisation of residual streams from drinking water production is truly taking off. The challenge is to render drinking water sector residual streams suitable for practical applications. Work is ongoing within OperAqua to develop products that meet market requirements. The symposium was opened by Luc Keustermans, Technical Director at De Watergroep, while KWR’s CEO, Wim van Vierssen, closed the event. The participants of the OperAqua symposium.